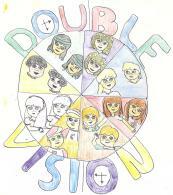 This page is for my comments on my first novel, Double Vision. Overall writing it was a great experience, but the writing itself is indisputably awful. You might have to read the excerpts to decide if you agree with me, but you may want to save yourself the pain and take my word for it. That said, here is a little discussion of what I did badly and what I did right in my first foray into long fiction at age fourteen. In some ways the characters behave kind of realistically. There is a lot of bickering between the main character and her brother, and the rivalry is pretty authentic-sounding. The punctuation and grammar are almost perfect and the spelling is very good. Though for some reason the main character's brother is named "Benjamen" instead of "Benjamin." Because of my interest in naming trends, I managed to handle the naming of nine sets of twins in realistic ways. Meaning that I took into account the fact that many parents are tempted to do goofy things to twins' names that they wouldn't do to ordinary siblings'. About half of the twins in the story either had names that rhymed (Cara and Sara, Dustin and Justin) or names that started with the same letter (Nadia and Natalie, Laurel and Lilly, Carmen and Candace). However, other twins were named with unrelated names (Cristabel and Benjamen, Craig and Mike, Zachary and Brian, Misti and Celeste). There was some interesting diversity among the characters. I seem to have done the usual "let's throw in different races to make sure no one thinks I'm prejudiced" thing, and all the characters are white except a token pair of black twins and a token pair of Asian twins. However, there were other things that showed diversity in ways that aren't overused and silly: For example, one of the sets of twins was a white family that got in a car wreck long before the story started, and the parents and one of the twins died. The surviving twin was adopted by a black family, but nothing is ever said about that—like, nothing in my story indicated that I thought it was weird, and it wasn't a plot point. The adopted ex-twin refers to his adoptive mother's son as his little brother and is accepted as one of the family. Despite the fact that the main character looks a little like me (blonde hair, blue eyes, light skin), she isn't very much like me at all; even back then I was good at not making the character just a copy of me. She likes things I didn't like (like cheeseburgers), has a brother while I don't, gets mad about things that wouldn't have bothered me, and has idiosyncracies of speech I didn't have. It's also nice that she has quite a few faults and sometimes does things like cheat and lie and refuse to admit things are true just to save face. It's nice that despite my young age I didn't just write a heroine who can do no wrong. Occasionally there was actually character growth. The main character realizes she's being illogical sometimes, and her brother (who is sometimes the antagonist and sometimes the confidant) sometimes teaches her a lesson or learns one himself. Sometimes Cristabel's emotions are well-written and realistic for a thirteen-year-old. There was a part where she lost her cool and cried while on the telephone, but was embarrassed that her brother saw her do it. People often act in completely unrealistic ways. The storytelling style is utterly embarrassing. The "hijinks ensue" factor is very high. For instance, when a couple of the characters learn a hypnotism technique, they decide to try it out on a teacher at their school, and they succeed in hypnotizing her to go find another teacher and put an orange down his pants. Somehow this behavior is never investigated or touched on again; it's obviously written like you're supposed to find this hilarious. There is some very bad science in this book. I'm not sure where I got the idea to say something like "The ions stopped being ionized." There are sometimes long passages of completely unnecessary information, such as an explanation of how human female and male embryos start off the same until the male ones get "extra" instructions from their genes to start developing as males, or a very involved set of steps on how to do a complicated card trick. If I had thought the plot out better, I probably wouldn't have left so many HUGE plot holes. If the experimental drug was taken off the market because Carmen's twin was born dead and the drug might have been to blame, why were there THREE MORE SETS OF EXPERIMENTAL PARENTS subjected to its use before it was pulled from the market? That doesn't make any sense. All the "good guys" in this book are sets of twins from age fifteen to age seven, except for an eleven-year-old boy who no longer has a twin because of his dying in a car wreck and a nine-year-old girl who was born one of a set of twins but her twin was stillborn. Since everyone else has a twin, the "orphaned" twins sort of end up lumped together. But this does not mean it makes a damn bit of sense for the administration at their boarding school to PUT THEM IN A ROOM TOGETHER. Who puts an eleven-year-old boy in a dorm with an unrelated nine-year-old girl and thinks that's perfectly fine? And isn't it . . . kind of creepy then that they jokingly refer to one another as each other's "fake twin," yet they also have a crush on each other and have been seen holding hands? The aforementioned two "orphaned" twins both happened to have red hair and amber eyes, which makes it easier for everyone to lump them together. What are the chances of that? I worked out a class schedule for everyone at the boarding school, including the teachers. I suppose I thought since I did the work I had to include it in the book. Just in case anyone wants to know where Natalie Keno is during hour 3, you can sure find out. Despite all the work I put into the schedule, looking at it now shows it makes no sense whatsoever. SEVEN-YEAR-OLDS ARE IN THE SAME SCIENCE CLASS AS FIFTEEN-YEAR-OLDS. Even though the "school" aspect of their existence at this place actually IS a cover operation, it doesn't make any sense to be that obvious about it. The students themselves are going to notice very quickly that their education is not being taken seriously if the group classes make no sense. There were an awful lot of lumps of narration that just went nowhere. We really don't need an explanation of what everyone did in the pool in what order. We're probably a lot more curious about what possessed everyone to independently decide to show up at the swimming pool at the same time. Misti and Celeste do an awful lot of hanging out with other people and voluntarily interacting with them for girls who were described as painfully shy and supposedly only talk to their own family. And there is no reason for them to speak in stereo as often as they do. I do not care if they are twins. That is stupid. Similarly, dumb "twin things" like Craig and Mike wearing ball caps that they tilt in opposite directions is really, really dumb. I made references to popular music, which is a GREAT way to unintentionally date your novel. Why is M.C. Hammer on the radio? I apparently couldn't decide whether Cara and Sara's last name was "Britten" or "Brittain." Er . . . you should always pick a spelling and stick with it. . . .
Ben gets a big kick out of calling his sister "Crissi" instead of her full name. He also likes to annoy her by interrupting a conversation in which she introduces herself by warning the new person that she will puke on them if they call her "Crissi." I apparently REALLY thought that was funny and kept using it over and over again. Despite the fact that I did a good job choosing "realistic" names that diverse parents would choose for twins, I did some really idiotic things too—most notably, I sometimes chose names (including last names) that were too fitting for the characters to be realistic. Laurel and Lilly Rivers were nature-loving twins, and somehow not only their given names but their family names relate to the outdoors. I guess that could happen, actually, though it seems a bit fishy. However, I think I completely overdid the moronosity when I created a pair of twins who were very pale with frizzy white hair and light eyes—who were also very mysterious because they were shy and didn't want to talk to anyone—and then I went and named them "Misti and Celeste Light." Light? C'mon. That's just silly. And they randomly had British accents even though they'd been born in Florida. Not that that's impossible, but there was no explanation for it. And speaking of names, it is not random and quirky to say that someone's real name is Jake but give him the nickname "Rupert" and have no reason for it. That's just weird and dumb. There is also no explanation for why Ben and Cristabel are the only fraternal twins. If the drug their parents took "caused" twins, it seems impossible that they could be different sexes when nobody else was. I did that horrible thing where I broke the fourth wall in the first chapter to have the main character talk to the reader and introduce herself. " . . . And my brother's name is Ben. He has blond hair, like me. He's thirteen, like me. Unless you're stupid, the idea might have entered your brain that we're twins." God, that's bad. There is no justification for how poor my planning was in this thing. There is a big secret that's been hidden for years about these kids in the story, but nobody's ever told them or their parents (and, y'know, it would be a matter of National Security if anyone, including the kids themselves, found the secret out). But somehow it makes perfect sense for one of their teachers to pretty much take each student aside individually and tell them most of it, and of course there was no admonition that they must keep it secret, nor was there any acknowledgment that hey, they might actually TELL EACH OTHER and . . . have a problem with basically being held captive at a place that's pretending to be a school. Being the protagonists, Cristabel and Ben were of course the first successful twins to escape their "prison." But did their plot to free the others have to be so damn DUMB? Yeah, let's raise a few hundred dollars with our homemade magic show and buy bus tickets for everyone. Not to mention that making a phone call and telling the other twins to "cover for us" does not explain why no one seemed to notice they were gone. Hello! I attempted to make the unusual abilities the twins acquired be derived from some semblance of possible science, but really it was just my dumb excuse to give them neat powers. It could have been acceptable if I'd kept it restricted to sending and receiving radio signals (because hey, I've heard urban legends about people who can get the radio through their tooth fillings! ), and MAYBE even the balderdash about attracting and repelling objects could have worked if I'd kept it to just metal things (erm, but I didn't). But there isn't any metallic substance that can bounce off of mirrors and read your thoughts, and there's no metallic substance that can predict the future either. Not to mention that it makes no sense that nobody except the Light twins figured any of this out on their own until they came to the "school." Despite having no real bonding experiences, all the sets of twins are friends for life at the end. Ho-hum. If you were amused by this and want to see more old bad writing, be sure and check out the "ancient history" section of my writing page.